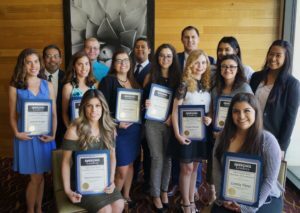 The 2018 graduating class of Emerging Leaders held their completion ceremony at the JW Marriott Desert Springs Resort & Spa on May 11. 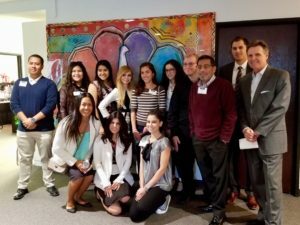 Consisting of 14 students from College of the Desert and the CSUSB Palm Desert Campus, the eight-month Emerging Leaders program allowed them to tour local Coachella Valley businesses and practice professional skills necessary to assume leadership roles in the community. The 2018 Emerging Leaders class at their completion ceremony on May 11. Photo courtesy of Diane Kovalsky. Emerging Leaders was first created in 2016 by the chair of the Education Committee for the Palm Desert Area Chamber of Commerce Diane Kovalsky. The program started to take shape after she met with other education and business representatives and discussed what kind of traits employers find desirable in new hires. “We identified gaps between classroom learning and brainstormed ways to transfer knowledge outside the classroom learning environment in a meaningful way. We listed many essential skills needed that those young professionals should be taught with an opportunity to practice these skills,” said Kovalsky. Each of the monthly meeting days for the Emerging Leaders program are themed. The selected topics for the 2018 class sessions included non-classroom education, communication, operations, tourism, government, health and wellness and hospitality. Two Education Committee members from the Palm Desert Chamber of Commerce volunteered to develop the agenda for each of the themed days. Emerging Leaders visited the KMIR television studio in Palm Desert. Photo courtesy of Diane Kovalsky. Once it was decided how many worksite tours could fit into one session, the Chamber liaison and committee members determined which Chamber members worked within a particular industry so they could contact the business owner to coordinate the date and time of the Emerging Leaders’ visit. This year’s program differed slightly from the inaugural class of 2016-2017. Based off of feedback given by former participants of Emerging Leaders, it was found that a first-day orientation to give students the chance to learn about each other and the expectations of the program would be helpful. By taking part in the Emerging Leaders program, students can learn from business representatives about essential skills needed for employment such as networking, practicing mock interviews, or getting hired in a digital age. Participants also become aware how their college major can fit into various career fields and the different employment and internship opportunities available to them. From the 2018 graduating Emerging Leaders class, seven students have pursued and obtained employment through the program. 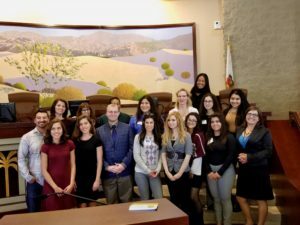 Emerging Leaders toured Palm Desert City Hall to meet with the mayor and other representatives. Photo courtesy of Diane Kovalsky. “Emerging Leaders is a beneficial program every college student should take advantage of. I learned that there’s never that ‘perfect’ job waiting for you after college. It all starts with an open mind, a willingness to network with others, and getting out of your comfort zone even when you don’t know what lies on the other side,” said Emerging Leaders graduate Genevieve Knight. Applications for the 2018-2019 Emerging Leaders class will be available near the end of May at the College of the Desert Career Center and CSUSB Palm Desert Campus offices and websites, as well as through the Palm Desert Area Chamber of Commerce office and website. Students interested in joining the program must have a GPA of 2.5 or above and be a current student at a Coachella Valley accredited university or higher education institution for the academic year to participate. A $50 program fee and commitment to attend all meetings must also be received. Kovalsky, who also serves as the Career Services Advisor at the CSUSB Palm Desert Campus, is confident about the positive effects the Emerging Leaders program will have on students as they integrate themselves into the workforce.